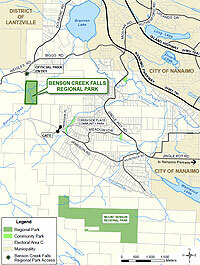 From June to December, 2013, the Regional District of Nanaimo conducted research and a public process for updating the Benson Creek Falls Regional Park Management Plan. The project involved a review of objectives from the first Management Plan developed for the park in 1999, on the ground research, park user surveys, stakeholder interviews, two public open houses, and online / social media communications. Benson Creek Falls Regional Park was first established in 1991 through a lease with the Province of British Columbia, Lands Branch for a period of 30 years to 2021. A Management Plan Brief and Environmental Overview were prepared in 1999. This initial plan set out a framework for the parks vision, use and future development priorities. To begin the project, an Environmental Overview study was conducted in early 2013 by Ursus Environmental, in order to review the environmental changes in the park since the 1999 Environmental Overview and Management Plan. With the 2013 Environmental Overview providing valuable background and context, RDN staff and consultants explored with stakeholders, community groups and residents, whether the vision, objectives and actions outlined in the 1999 Plan is still applicable and where changes or new ideas and priorities are required. The resulting Management Plan confirms a long-term vision and updated set of goals for Benson Creek Falls Regional Park, and both short term and long term management objectives and actions for managing the park through 2014-2024.